More than 230 dead after 7.1 magnitude earthquake in Mexico - Balita Boss! A 7.1-magnitude earthquake hits southern Mexico 123km from Mexico City, in Puebla on Tuesday, September 19 (September 20 in the Philippines). The quake hit the city during the celebration of the 32nd anniversary of the biggest earthquake to strike the capital on 1985 quake which killed 5,000 people and caused serious damage to the greater Mexico City area. 237 people were reported dead which includes 21 children who were inside the collapsed of a private school building. The earthquake was located about 75 miles southeast of Mexico City at a depth of 32 miles and caused extensive damage, destroying at least 44 buildings, including homes, schools and office buildings. US president Donald Trump already offered its condolences to Mexican President Enrique Peña Nieto and promised a search-and-rescue assistance if ever needed. 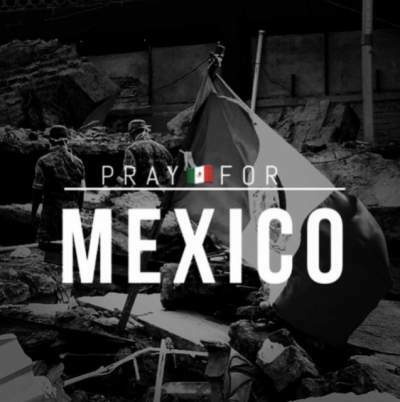 Furthermore, Enrique Peña already declared a 3-day national mourning all over Mexico to honour the victims of the tragedy. On the other hand, Foreign Affairs Secretary Alan Peter Cayetano said that there are no reports of casualty from the 60 Filipino Community members in Mexico City but the Philippine embassy was badly damaged. Still, embassy personnel are continuously takes up coordination with the Filipino community in the damaged city and monitors the situation. The earthquake is second major quake to hit Mexico in two weeks 12 days after a magnitude 8.2 quake struck off Mexico's southern Pacific coast.